Norman Robert Foster, OM, FRIBA, FCSD, RDI (born 1 June 1935) is an English architect. His company, Foster and Partners, has an international design practice. He is the United Kingdom's biggest builder of landmark office buildings. He is one of Britain's most prolific architects of his generation. In 1999, he was awarded the Pritzker Architecture Prize, often referred to as the Nobel Prize of architecture. In 2009 Foster was awarded the Prince of Asturias Award in the Arts category. Foster was born to Robert Foster and Lilian Smith in 1935 in Reddish, Stockport, Cheshire. They moved, soon after his birth, two miles to 4 Crescent Grove in Levenshulme, Manchester, which they rented for fourteen shillings (70p) a week: Foster has no recollection of Reddish. Foster's parents were diligent, hard workers – so diligent that Foster, as an only child, felt their heavy workload restricted his relationship with them and he was often looked after by neighbours or other family members. He attended Burnage Grammar School for Boys in Burnage. In a Guardian interview in 1999, Foster said he always felt 'different' at school and was bullied and he retired into the world of books. He considered himself quiet and awkward in his early years often making faux pas. He left school at 16 and worked in the Manchester City Treasurer's office. Next, he joined the National Service in the Royal Air Force. After he was discharged, in 1956 Foster attended the University of Manchester's School of Architecture and City Planning. He graduated in 1961. Later, Foster won the Henry Fellowship to the Yale School of Architecture, where he earned his Master's degree Foster also met Richard Rogers at Yale. He then travelled in America for a year. He returned to the UK in 1963. Then he set up an architectural practice as Team 4 with Rogers and the sisters Georgie and Wendy Cheesman. Georgie (later Wolton) was the only one of the team that had passed her RIBA exams. This allowed them to set up in practice on their own. Team 4 quickly earned a reputation for high-tech industrial design. Foster took a job as assistant to a contract manager with John Bearshaw and Partners, a local architectural practice. The staff advised him, that if he wished to become an architect, he should prepare a portfolio of drawings using the perspective and shop drawings from Bearshaw's practice as an example. Bearshaw was so impressed with the drawings that he promoted the young Foster to the drawing department of the practice. Foster won the Henry Fellowship to the Yale School of Architecture, where he met future business partner Richard Rogers and earned his master's degree. Vincent Scully encouraged Foster and Rogers to travel in America for a year. After returning to the UK in 1963 he set up an architectural practice as Team 4 with Rogers and the sisters Georgie and Wendy Cheesman. Georgie (later Wolton) was the only one of the team that had passed her RIBA exams allowing them to set up in practice on their own. Team 4 quickly earned a reputation for high-tech industrial design. After Team 4 went their separate ways, Foster and Wendy Cheesman founded Foster Associates, which later became Foster and Partners in 1967. A long period of collaboration with American architect Richard Buckminster Fuller began in 1968 and continued until Fuller's death in 1983. They collaborated on several projects that became catalysts in the development of an environmentally sensitive approach to design – including the Samuel Beckett Theatre project. Foster gained a reputation for designing office buildings. In the 1980s he designed the HSBC Main Building in Hong Kong for HSBC. The building is marked by its high level of light transparency, as all 3500 workers have a view to Victoria Peak or Victoria Harbour. Foster said that if the firm had not won the contract it would probably have been bankrupted. Foster believes that attracting young talent is essential, and is proud that the average age of people working for Foster and Partners is 32, just like it was in 1967. View of 30 St Mary Axe. The building serves as the London headquarters for Swiss Re and is informally known as "The Gherkin". Today, Foster + Partners works with its engineers to use computer systems. They pay attention to basic physical laws such as convection. They have created efficient buildings like the Swiss Re London headquarters in London. The walls let in air for passive cooling and then let it out as it warms and rises. In January 2007, The Sunday Times reported that Foster had called in Catalyst, a corporate finance house, to find buyers for Foster + Partners. Foster does not want to retire, but wants to sell his 80-90% holding in the company valued at £300M to £500M. Foster is a member of the board of Trustees for the architectural charity Article 25. They design, construct and manage safe, sustainable buildings in dangerous parts of the world. He has also been on the Board of Trustees of The Architecture Foundation. The reason for his wealth is he receives 15% of the building cost. 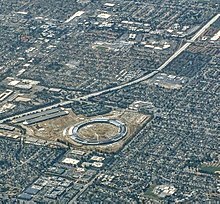 Foster designed the Apple Campus in Cupertino and is currently designing most of their Apple stores. He is also designing Bloomberg's headquarters in London. He also recently designed the Monaco Yacht club and the McLaren technology centre. He has recently set up the Norman Foster Foundation which promotes interdisciplinary thinking and research to help new generations of architects, designers and urbanists to anticipate the future. Foster was knighted in 1990 and appointed to the Order of Merit in 1997. In 1999, he was created a life peer, as Baron Foster of Thames Bank, of Reddish in the County of Greater Manchester. He is a Crossbencher. Norman Foster is the second British architect to win the Stirling Prize twice: the first for the American Air Museum at the Imperial War Museum Duxford in 1998, and the second for 30 St Mary Axe in 2004. Foster was awarded the Pritzker Architecture Prize in 1999. He is also a Fellow of the Chartered Society of Designers and winner of the Minerva Medal, the Society's highest award. In Germany Lord Foster received the Order Pour le Mérite. Most recently, in September 2007, Foster was awarded the Aga Khan Award for Architecture, the largest architectural award in the world, for the University of Technology Petronas, in Malaysia. It was announced in January 2008 that Foster was to be awarded an honorary degree from the Dundee School of Architecture at the University of Dundee. In 2009 Foster was awarded the Prince of Asturias Award in the category Arts. In 2017, he was awarded the Freedom of the City of London for his contribution to contemporary architecture. Foster married business partner Wendy Cheesman. She died in 1989, leaving him with four sons. He next married Indian-born Begum Sabiha Rumani Malik. Sabiha was married to Andrew Knight when she and Foster met. Knight was Chairman of News International. Foster and Sabiha divorced in 1998. Foster is now married to Elena Ochoa, Chairman of the Tate International Council, and founder of Ivory Press. He has five children and three grandchildren. Foster flies his own private jet and helicopter between his homes in London, France, Switzerland, Marthas Vineyard, New York and Madrid. The restored Reichstag Building in Berlin, housing the German parliament. The dome is part of Foster's redesign. ↑ Pritzker Architecture Prize, "Norman Foster, 1999 Laureate"; retrieved 2013-3-27. ↑ "The Tenth Award Cycle 2005-2007". The Aga Khan Development Network. Retrieved 2009-01-21. ↑ "Petronas University of Technology receives 2007 Aga Khan Award for Architecture". Foster + Partners. 2007-04-09. Retrieved 2009-01-21. This page was last changed on 25 January 2019, at 16:54.